Frank Samuel Macdonald of Loveland, Colo. died Dec 5, 2012 at Pathways Hospice Care Center. He was born on Dec 24, 1924 in Valverde, a truck farming area west of the South Platte River in Denver, to Frank P. and Lois E. (Merman) Macdonald. Sam attended McKinley Grade School and Grant Jr. High and graduated from South High School in 1942. He was a member of the South Platte Park Pirates softball team. His first paying job was as a caddy at Denver Country Club, he went on to be a “sweeper boy” during Jr. High and High School. He joined the U.S. Army in December 1942. After boot camp at Camp Walters, Texas and training at Camp Clairborne, Louisiana, he became a rifleman in the 84th Infantry Division. As a Staff Sergeant, he survived the Battle of the Rhine, the Battle of the Bulge and Battles of Central Europe. His division helped secure the Allied Victory in Europe. He received the Combat Infantry Badge, a Bronze Star and a Purple Heart. 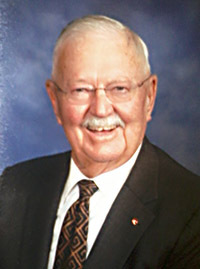 He was a lifetime member of the 84th Railsplitters Society. In 1949, he graduated from Colorado A&M College (Colorado State University) with a degree in Animal Husbandry. Sam worked as a Ranch Manager and later a Livestock Buyer for Armour & Company at the Denver Stock Yards. He was employed by the City & County of Denver in the Public Health Department. Governor Love appointed him to the Board of Registration for Professional Sanitarians. Sam served as the President of Colorado Public Health Association, the Colorado Association of Sanitarians, and the Denver Health & Hospital Employees Club. Sam taught First Aid classes, was active in Boy Scouting, and volunteered for Meals on Wheels and the Museum of National History. He was a 32nd degree Mason, and a member of Park Hill Masonic Lodge #148 and the Denver Consistory. In his spare time, Sam enjoyed building houses with his father and brother and managed property until his retirement. In 1955 he met and married the first love of his life, Jeanette (Jenny) Starks. They met on a Colorado ski slope and were the parents of a son and two daughters. They were members of Park Hill United Methodist Church. The family spent many vacations beach combing in Texas on South Padre and Mustang Islands. After 31 years of marriage, Jenny died from Congestive Heart Failure. In 1987 he married the second love of his life, Dianne L. Ashmore and they purchased a small farm near Berthoud in 1991. Sam transferred his church membership to the Berthoud First United Methodist Church in 1991. He was a charter member of the Park Hill Lions Club and transferred his membership to the Berthoud Lions Club. He received the Melvin Jones Award and was active in all the Lions Club activities. He was a member of the Berthoud Barn Owls square dance club and Berthoud AARP. He was preceded in death by his grandparents, Samuel Percival and Meta (Munneke) Merman and Percival and Jessie (McNeil) Macdonald; his parents; his first wife, Jenny; and two siblings, his sister Jessie Tompkin, and brother Bruce. Sam is survived by his wife, Dianne; son Douglas (Lisa) MacDonald; daughters Rebecca Macdonald and Kimberly Bilson Macdonald; grandchildren Joshua, Ryan, Brandon and Harley Wiggins, Ryan MacDonald, and Malachi and Colby Bilson; a sister, Adele Hause; a brother-in-law, Glenn Ashmore and many beloved nieces, nephews and cousins. Sam was always interested in people and made friends everywhere he went. He leaves behind a legacy as a loving, faithful husband, father, brother, uncle, cousin and devoted friend to all who knew and loved him. His wonderful sense of humor will be missed by all. Next Story: Why Can’t My Cat Breathe? Site contents copyright © 2019 Recorder Online	except as noted. All rights reserved. | 90 queries in 2.172 seconds.